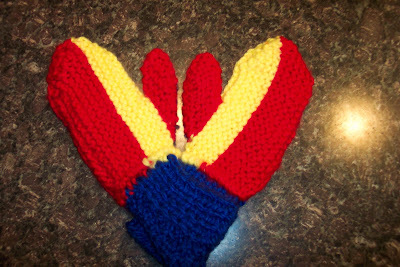 This weekend, I made a pair of mittens for Jabin. Actually, come to think of it, Jabin's current set was originally Noah's. 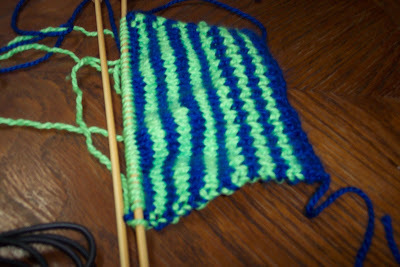 However, I started a new one for him this spring, since the ones he was pictured in last January are too small for him. 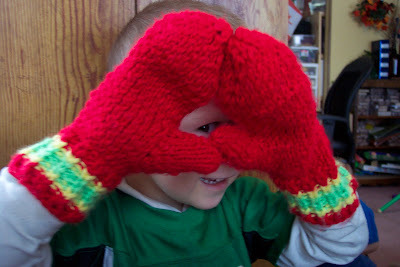 I purposely made the newest mittens bright red so that, unlike the hunter green/navy combination (a colour choice originally made by Jude--he grew out of them before I finished! Oops! 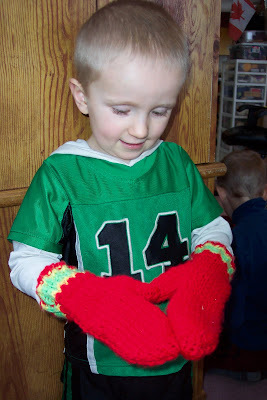 ), they would not only be easily visible against the snow, but also in the mittens' basket and van. The project finished just before beginning on Jabin's Rosy Reds was Jude's Camo Toque, which finished his set. I don't know why the kid is so into camo, other than that his friends are. It must be a boy thing. I'm not going to try to understand it, I'm just going to go with it. 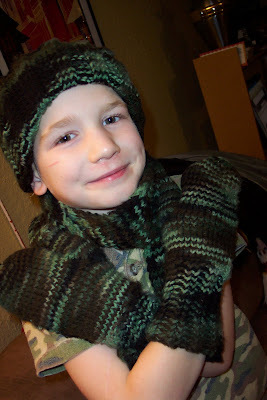 Which is why I let him choose camo yarn for his winter warmth gear this year. Finishing Jabin's mittens so fast, and therefore finally having a fully be-mittened family, inspired me to whip up an extra few pairs for when the originals are soggy. (Gotta love chunky yarn and bigger needles.) 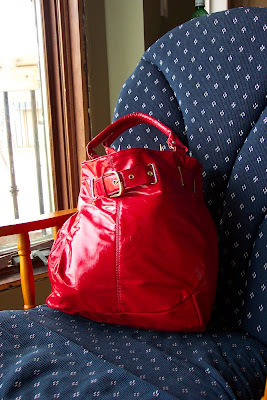 I have tons of Bernat Softee Chunky in child-bright colours, so why not, right? However, just as I was finishing the cuff today, I remembered a few newborn babies in need of shower gifts, so this was immediately transmogrified into the first sleeve of a baby cardie. And have I mentioned that red is my favourite colour? Wow! Good Stuff! The only thing my mum tried to knit me once was a sweater. And I always outgrew it by the time I was done. She pulled it apart about 4 times before re-knitting and then giving up. The wool went crinkly and I always considered it 'special wool'. LOVE the camo mittens. So cool. Ace - Ha! "Class 4 stitching" must be equivalent to our "Grade 7 Home Ec." Good on ya' for the cushions! Go go go! on the curtains! I knit while I watch movies. And during other "down time" moments, when my hands would otherwise be unoccupied. It's called "multitasking," I hear, and it's how I manage to feel productive even if I'm mostly not.